It is 2018. And for many the world is a challenging place. People seem more judgemental and when they try to stand up for themselves they are made fun of and ganged up upon when what is needed is validation. The situation feels contradictory to what we, at The Society for Recovering Doormats are working so diligently to overcome. Does it seem to you we’ve taken several giant steps backward in every arena? Violent worldwide terrorism, domestic violence, and random mass shootings have escalated. People spew hate while acceptance and equality for all backslides into dangerous echoes of decades passed. For many of us our heroes and role models have fallen off the pedestals we built for them and global warming is still a debate. These are just a few reasons making me want to put my head in the sand. But I cannot; and neither can YOU. Now, more than ever it is important for everyone to open their eyes, stand up and use their voice. It’s vital we get up off the floor and speak our truth. The #metoo movement is a positive beginning, shedding light on despicable situations shrouded in silence for decades. We must remain vigilant with everything else too. We can no longer continue as doormats, remaining silent and muddling through as matty messes, feeling isolated and allowing ourselves to be manipulated. This is a difficult concept for people pleasers because we’ve depended on the validation of others to determine our self-worth. But now we need to understand the ineffective and dangerous consequences resulting from this antiquated belief. The only person that needs to validate you is you. Take a moment to process this overwhelming idea, and then take as much time as you need digesting it into a fact. Change is scary and if you’re like me, you’ve lived as a doormat for decades and tempted to ignore my insights. It is vital that you don’t! Standing up and speaking out, cutting ties with toxic people and changing our behavior is crucial. It is overwhelming but necessary in order to recover from doormatism and fly free. The good news is that you don’t have to do this alone. Here at The Society for Recovering Doormats like-minded people gather and offer encouragement and support. The Society is a safe house where we pick ourselves up off of the floor, and speak out for what we want, refusing acceptance of what doesn’t align with our needs and moral compass. This is a major first step for a mat. This concept isn’t novel. In Paris there’s The Society for Encouragement. I’m sure it has nothing to do with helping doormats, but wouldn’t it be great if it did? And there are books written and programs designed by mental health specialists offering advice and everyday strategies. Helping the mat recover from doormatism has been a valiant, ongoing effort. We are too nice, too loving, trusting and non-confrontational people with low self-esteem. Our doormatish behavior make us easy targets for narcissists and other unsavory individuals with manipulative, self-serving agendas. It’s due time we raise our collective consciousness and put an end to doormatism. We’ve been ignored for too long. Seen, but not heard, used and abused. I say “No more on the floor!” It’s time for lady recovering mats to be a Queen in 2018! And for male mats; be the King you’re meant to be. Your inclination to explore this site is a good indicator that you may have doormatish tendencies. Most people don’t realize they’re a mat until later on in life. During our formative years we are blissful and unaware of our mat status. 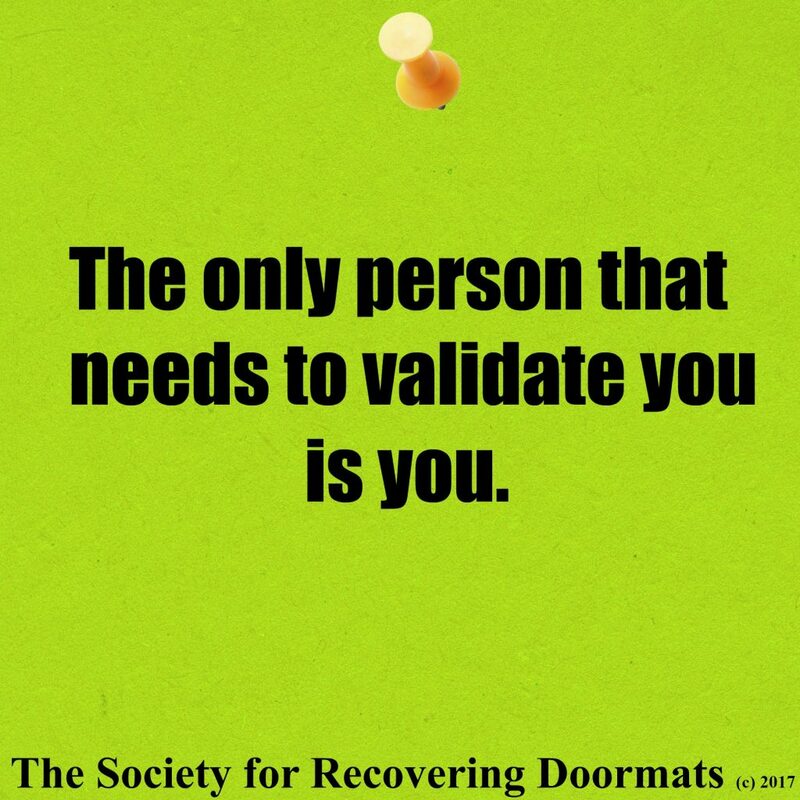 Many remain unaware until one day they discover The Society for Recovering Doormats and recognize themselves in most of the posts. It is at that moment the cumulative damage from years of people pleasing and accommodating is realized. If this sounds like you, then you are a doormat. But now we can no longer smile to mask our pain. We must not remain silent and miserable from neglecting our personal needs. Now is the time to reclaim our power by standing up and speaking out. I am not a medical professional, or a mental health specialist. Just a recovering doormat trying to help as many doormats as I can. One mat at a time. Wishing you an empowered New Year. Rose Gardner, founding member, creator, and recovering doormat.